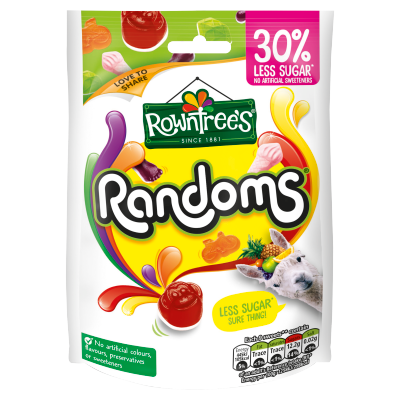 ROWNTREE'S 30% REDUCED SUGAR RANDOMS are completely free from any artificial sweeteners and are still bursting with irresistible fruity flavour. 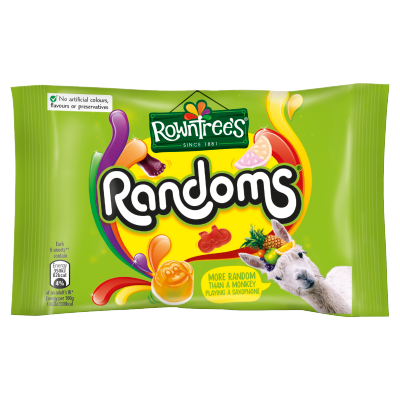 From ping-pong paddles and paint brushes, to snowflakes and saxophones - each pack of ROWNTREE'S RANDOMS contains hundreds of possible random sweet combinations. With so many shapes, textures and flavours no other sweets are this randomly playful! In 1862, Henry Rowntree bought a simple cocoa works in the city of York and turned it into a confectionery company. Henry was joined in business in 1869 by his brother Joseph Rowntree who eventually took over and transformed the company's fortunes. The brothers hired French confectioner August Claude Gadget, and with his expertise, they developed the recipe for ROWNTREE'S Fruit Pastilles, which they launched in 1881. Following on from this, the confectionery company developed ROWNTREE'S Fruit Gums, JELLY TOTS and TOOTY FROOTIES. 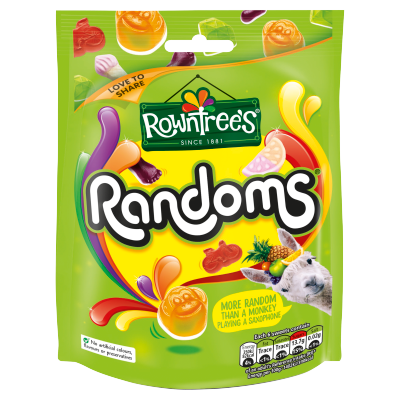 2009 saw the launch of the newest edition to the family - ROWNTREE'S RANDOMS. 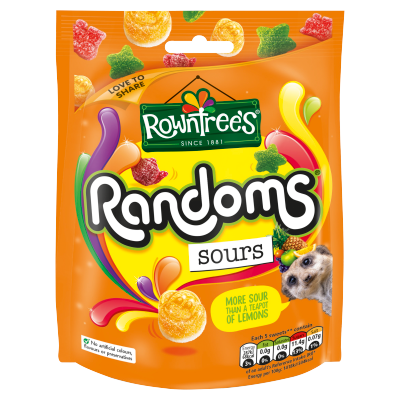 Every bag of ROWNTREE'S RANDOMS contains a different combination of textures, shapes and fruity flavours. ROWNTREE'S pledge no artificial colours, flavours or preservatives in any of their products. 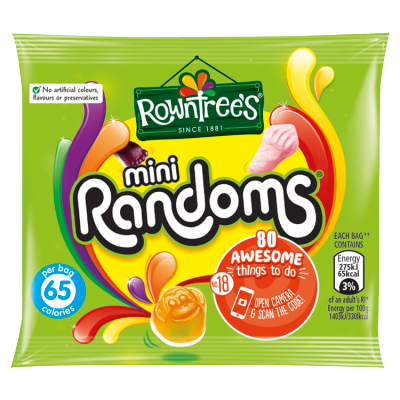 ROWNTREE'S 30% Less Sugar Randoms 110g is rated 4.6 out of 5 by 365. Rated 2 out of 5 by HuggyPhoto from Not As Good As They Used To Be Firstly, I’m on the page for the regular Randoms but up pops a title that I am reviewing the 30% less sugar version! I checked twice and asked my wife to check but I was doing it correctly. It kinda sums up Randoms perfectly! I used to love these but they don’t seem to be as fruity as they used to be and what the goodnessl have you done with the green ones?!! They were my favourite but no longer. As for the tasteless marshmallows!! 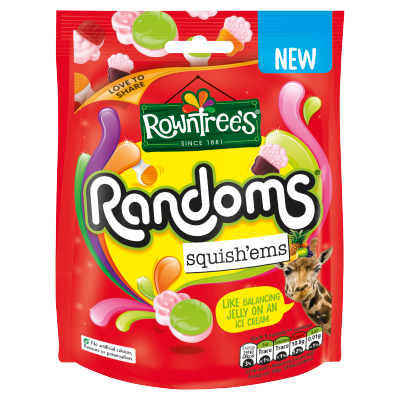 Rated 1 out of 5 by Nikki1993 from Not to pleased So far every bag of rowntrees I've bought they have either contained 1 or none of the ice cream cones I am really disappointed as these are a favourite it should contain a fair amount like the others once again very disappointed. Rated 4 out of 5 by georgia1234 from ONE MARSHMELLOW! BrOugHT 50g pack.... ONE MaRSHmallow livid. Otherwise I love this product. Rated 5 out of 5 by Mac Frost from Randoms spurs are sweeeeeeeet the regular randoms are good but these are a whole other level, tangy and sweet greatness! Love them and will without doubt buy again! Rated 5 out of 5 by sazparilla from Love them! Adore Randoms....thank you for creating them!!! I still use the phrase "and bobs your teapot" from the adverts....I do get some funny looks. Love it!!!! Rated 3 out of 5 by Random from Too many cones! Randoms are my little treat but disappointed that 3rd packet I've opened is a other nearly all icecream cone foam ones. I like these but not 3 bagfuls!